I am exhausted after my TamilNadu meal post and I have just enough strength to give you an elevator pitch about this Tomato Oambal from Tripura. Tripura – landlocked small state in the northeast – mostly mountainous – home to many tribal groups and Bengali migrants. Culture and cuisine also influenced by Bengali practices. Tripuri food uses a lot of fermented fish and bamboo shoots. Oambals are made with a variety of vegetables – tomato, pumpkin being the most common ones. This tomato oambal is hot, tangy and sweet all at the same time – loved the explosion of flavours in every bite – served Jharkand dal pooris with this tomato oambal – loved it. Must try. 1. Heat oil in a pan. When hot, add mustard seeds and when they splutter, throw in the red chillies. 2. Throw in the chopped tomatoes and sauté till they turn soft. Add a little water if necessary. Add jaggery and salt and mix well. When is semi-thick like a chunky sauce switch off. Serve with anything. This entry was posted in Chutnies & Dips and tagged Blogging Marathon, chutney, dip.sauce, hot and sweet tomato dip, recipe, tomato oambal, Tripura food. This could be one of the simplest recipes but the paanch poran gives it a wonderful lift…and makes it delicious. panch poran in this chutney should have it so much more flavorful!! Slurp, super like.. Simple and delicious chutney, that panch poran enhances the flavors na. What a lovely dish. It sounds so similar to the Ambal I made for Jammu. Easy and tasty chutney !! 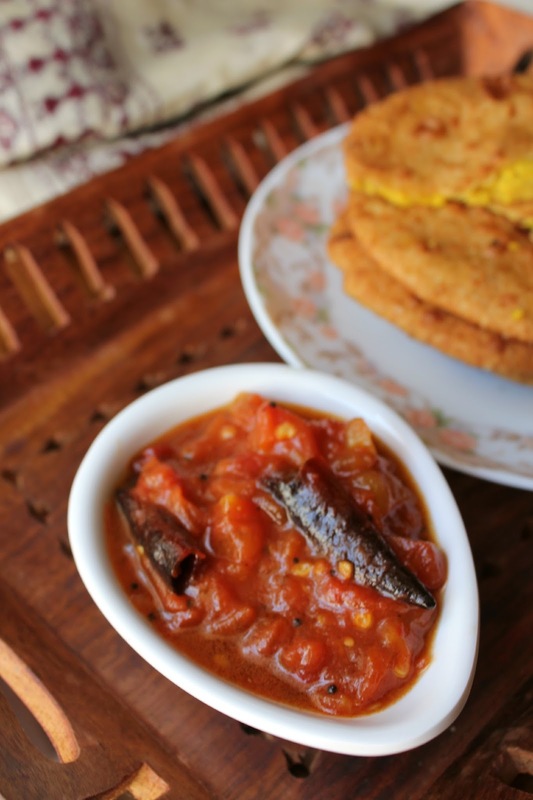 Finger licking tomato oambal,tastes great with roti as well as rice…. wow wow this looks super tempting and lip smacking dear 🙂 looks so yummy ….